Popular Gujarati humourist Taarak Mehta, whose work inspired the hit Hindi sitcom "Taarak Mehta Ka Ooltah Chashmah", died here aged 88 on Wednesday morning after a prolonged illness, his family said.A string of politicians, including Prime Minister Narendra Modi, condoled his demise and expressed gratitude towards him for bringing a smile to their face with his works. "He died of old age," said Atul Bhatt, a relative of the writer, who was well-known in the Gujarati theatre circuit and wrote a popular column for a daily.Mehta was born in December 26, 1929. The Padma Shri awardee's most noted works include "Duniya Ne Undha Chasma", which inspired the hit Hindi sitcom "Taarak Mehta Ka Ooltah Chashmah" that has been running since 2008. His knack of looking at contemporary issues from a different perspective was lauded, and his literary work always generated a good dose of laughter.Modi recounted how Mehta "never left the side of satire and pen".Reminiscing about his meetings with Mehta, Modi said: "I have had the privilege of meeting Mehta several times. I also got a chance to meet him when he was honoured with Padma Shri. His work reflects unity in diversity in India." Minister of State for Information and Broadcasting Rajyavardhan Rathore said his "humour made us all smile on many a blue day". 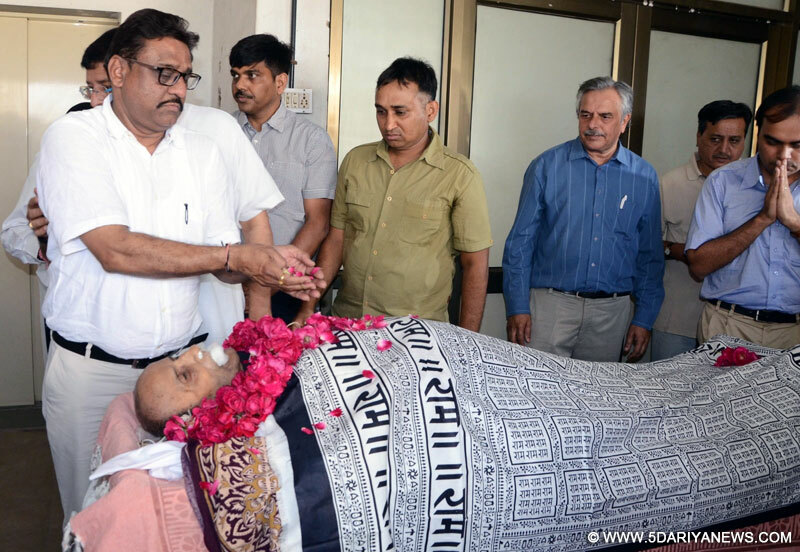 Gujarat Chief Minister Vijay Rupani tweeted: "Saddened by the death of Tarak Mehta -- humourist and columnist. He always brought smile to our faces. My condolences to family members." Delhi Chief Minister Arvind Kejriwal wished for his soul to rest in peace.Bharatiya Janata Party (BJP) President Amit Shah said that Mehta will always be remembered for his rich contribution to the society and the laughter he gave to millions. Minister of State for Road, Transport, Highway and Shipping Mansukh Mandaviya tweeted: "He who made us laugh, is no more amongst us! Saddened to know the demise of Shri Tarak Mehta. Characters penned by him will live forever.Surat's BJP MP Darshana Jardosh got nostalgic and wrote: "My 40+ years of 'association' with him ends. As a child, I started reading 'Oondha Chashma' in Chitralekha magazine. "Congress spokesperson Priyanka Chaturvedi thanked Taarak Mehta for all the laughs. Munmun Dutta, one of the actresses in "Taarak Mehta Ka Ooltah Chashmah", tweeted: "Saddened by the news of Taarak Mehta sir passing away. Last time when I met him, I could see his health failing him. He was still spirited and full of life. People will always remember him as the man who gave everyone the reason to laugh through his writings. My respect to him. "Actor Paresh Rawal also was extremely saddened by the passing away of Mehta and called him "a great humorist in any language".Actress Richa Chadha thanked Mehta for the humour.